With 85 percent of Americans online, content is king today for marketers--to build brands, demonstrate expertise and sell product. And no strategy may be more effective--or "kingly"--than video content and video marketing in light of this extraordinary statistic from Forrester Research: Video is worth 1.8 million words per minute of text. Just think about the sheer impact of 1.8 million words. If they were web pages, posts or tweets, they would number in the thousands, take months to write and remain largely unread given the challenge of reading that much copy. All this makes video strategy and video marketing the most effective use of a company's time, energy and dollars--and a new gold standard as a content marketing tool. The tech giants saw it coming early; for them, it's old news. Google acquired YouTube and IAC snagged Vimeo via its majority acquisition of Connected Ventures. And even Verizon has gotten in on the act with its recent purchase of AOL. But now the next big thing is here with live streaming thanks to Meerkat, Periscope and Facebook's celebrity streaming app. Then there's a veritable sea of long-form content, which is alive and well on Netflix, Hulu, Amazon and now even Yahoo. This explains why video ad sharing has multiplied over 63 times in the past decade. In fact, the numbers are exponential: 2014's most popular ad racked up 5.8 million shares compared with 2006's most popular ad, which only accrued 92,000 shares. Social media platforms such as Instagram and Vine are also taking center stage, with Instagram engagement surpassing Twitter last December and Vine boasting 1.5 billion daily "loops" (or views) at the beginning of 2015. Massive technology changes have been the foundation for this growth. Over the last 20 years, the best minds have engineered the right devices--as well as the networks, platforms and applications necessary to run video. And these technology advancements have enabled our brains to receive information in ways they naturally desire. For instance, the brain processes visuals 60,000 times faster than text. Getting a page one listing on Google Search increases 53 times with video, finds Forrester Research. But most significantly, the numbers surrounding video consumption are on the rise--to the tune of 50 percent year-over-year for YouTube alone. 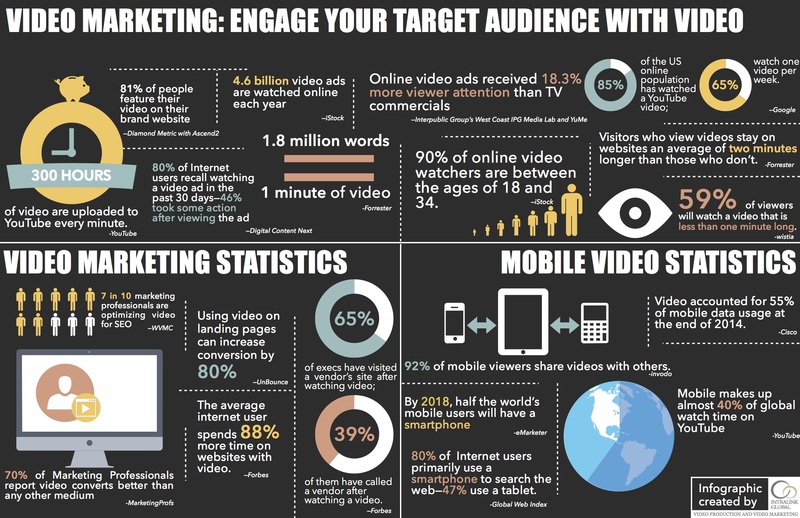 No wonder marketers are finding video to be one of their highest-return conversion tactics. They are seeing 200 percent - 300 percent improvements in click-through rates when video is embedded in email; higher Google rankings (53 percent) as mentioned above; and a six-fold improvement in recall, engagement, likelihood of product purchase and shareability. All this explains why marketers are using video more than ever and integrating it in everything they do. Right now, a quick check of YouTube shows 1,427 videos for AT&T, 415 for GE, 5,462 for Lego and 5,102 for Red Bull--all with millions of views--or billions in the case or Red Bull and Lego, which have elevated video strategy and video marketing to an art form. What are they doing with all that video? They are, more than anything else, engaging their targets and moving them to purchase products and services. They are using video strategy and video marketing to introduce their company, their products, their causes and their new initiatives. They are having customers help tell their video stories through testimonials and their own stories. They are informing, educating, tutoring, training, recruiting, teaching and selling. They are showcasing content from events, highlighting those events and their customers' participation in those events. They are entertaining their target audiences, but also advertising in short and long forms. But more than anything else, they are pushing this content through the communications eco-system. Evidence suggests video should be an important focus of companies' marketing budgets. And many are moving in this direction. But most companies do not have the skill to engage and further their goals and objectives. And as I look at the video strategy and video marketing landscape, many companies are just skimming the surface of this format rather than taking advantage of the marketing opportunities video offers. Do your own test by taking stock of businesses such as restaurants, hotels, retailers, construction, architecture, engineering and even manufacturing. All have great visual possibilities and stories that can be reimagined in compelling ways. But doing so requires partnering with true video marketers who understand search engine optimization, strategy, creative storytelling, marketing AND production and editing. No longer can you simply partner with a video production and editing house and be effective. Are you investing in video the way you should? Are you maximizing your story through video? Do you even have a video on your website? This is Video 101. For most, the answer, surprisingly, is still no. And for those who have done something great with video--please share your story with us so we can all continue to learn.